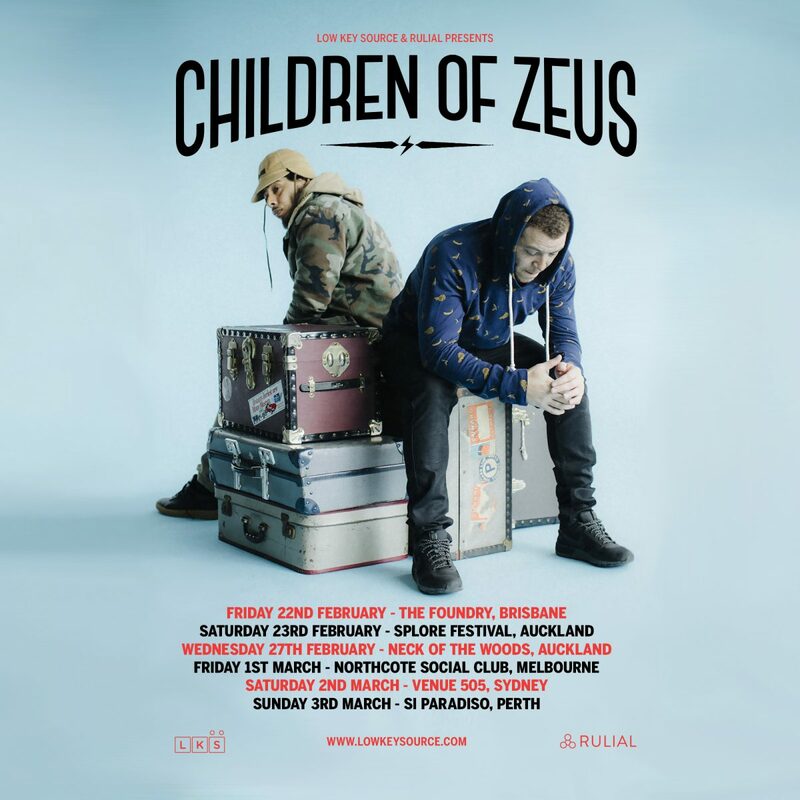 Low Key Source is tremendously excited to announce highly acclaimed Manchester soul and broken beat duo Children Of Zeus’ debut Australian and New Zealand tour commencing February and March 2019. Children Of Zeus garnished musical sensibilities world-wide with the release of their stand out debut single ‘Still Standing’ released in 2015, now considered an influential British soul classic. With a single highly recommended by industry folk and music fans, Children Of Zeus fast cemented themselves in the soul scene pushing Manchester on to the international map. After the success of their debut single followed by a teaser of COZ’s musical strengths with the drop of their 2017 EP ‘The Story So Far…”, expectations were high following the release of their highly anticipated debut album ‘Travel Light’ in July 2018 through First Word Records and Low Key Source. Exceeding expectations, tastemakers from all corners of the globe have applauded ‘Travel Light’ for Konny Kon and Tyler Daley’s quality production oozing boom bap neo soul sensibilities, vocal arrangements and harmonies distinctly COZ, whilst keeping their eclectic electronic influences in measured doses producing a sound uniquely their own. It’s been a long time coming for both rapper Konny Kon and vocalist/producer Tyler Daley whose individual musical history spans 20 plus years in the industry. Konny Kon stepped into the arena as an MC, DJ and beatmaker for hip hop crews The Microdisiacs and Broke’n’£nglish. Tyler Daley entered the scene as a songwriter, producer and vocalist under the name Hoodman. They first met in Paris whilst both on separate tour shows back in 2015. After establishing a connection based on their love of soul, garage, drum’n’bass and hip hop music, their collaboration seemed a no brainer. On their debut album, COZ have carefully handpicked family to work with such as K S R, former Broke’n’£nglish DRS, Terri Walker, K15, Sebb Bash, Juga-Naut, Beat Butcha, and your favourite DJ’s DJ, Mr Thing. Honing their craft as rapper, vocalist and producers, their timing could not have been better rebirthing both their careers into UK soul music heavy weights. As the industry continues to birth electronic R&B acts drenched in experimental electronic trap production, COZ stand out in a league of their own presenting the past sound of UK 90’s soul music back into the heart of the industry. They aren’t doing it for numbers, followers or major label attention. Children Of Zeus have emerged with a new love for music. They are doing it for the love – where it all started. Australia and New Zealand are about to experience for the first time ever, a sneak peek into UK soul music from two outstanding musicians slicing and dicing their way through a musical landscape yearning for the real. And if you need more explanation on the ethos of COZ, they address their career and musical trajectory in their first track on their album ‘The Story So Far’.